Historical Markers #1885 and #2255 in Louisville note the location of Churchill Downs, the racetrack of the "Run for the Roses," the famous Kentucky Derby. 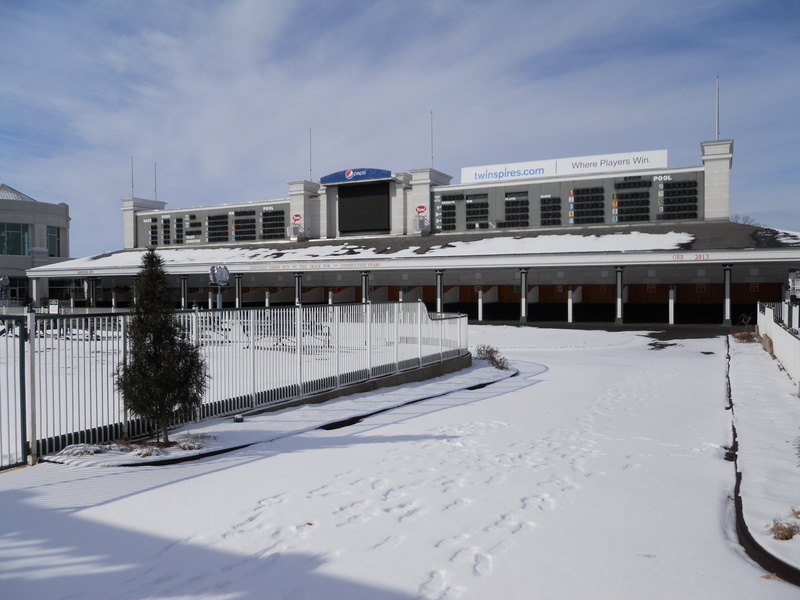 Churchill Downs began when track founder Meriwether Lewis Clark, Jr., the grandson of the famous explorer William Clark, raised funds to build a track on land owned by his uncles, John and Henry Churchill, then three miles south of Louisville. Clark went on to serve as the president of the racetrack for the first twenty runnings of the Kentucky Derby. The first race, in 1875, was won by Aristides, who was ridden by African American jockey Oliver Lewis. In 1895, with new president William F. Schulte in charge, the track featured a new 1,500 seat grandstands. The track’s trademark twin spires were constructed on the grandstands. At the turn of the twentieth century, Churchill Downs was in serious financial trouble and the possibility of closing neared reality. In 1902, Colonel Matt J. Winn was hired to change the track’s situation. Winn quickly turned the venture around by forming a group of investors to shore up the track's shaky finances. In addition, Winn began marketing the venue's events, including the Kentucky Derby, as the scene of fashion and influence among the wealthy as well as the middle class. Under Winn’s direction the Kentucky Derby became the "greatest two minutes in sports." Winn also used new technologies, including the radio and television, to broaden the reach and appeal of the Kentucky Derby to racing enthusiasts who could not attend the race. The race track's one mile circumference and long stretch have become iconic among generations of fans. 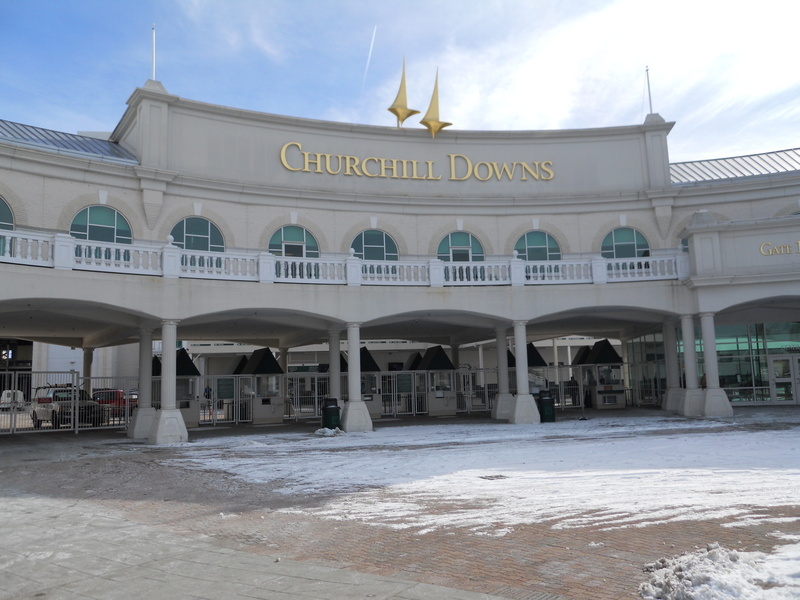 Although general interest in horse racing as a sporting event has declined, the iconic Churchill Downs and the Kentucky Derby continue to be synonymous with the identity of the state. The Twin Spires: This image shows the iconic twin spires of the Churchill Downs grandstands. Courtesy of the Library of Congress. 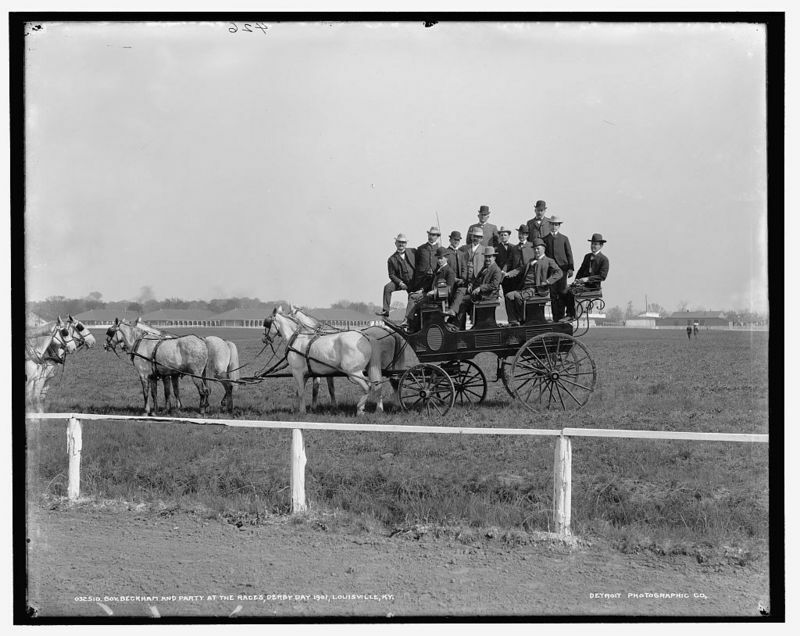 1901 Kentucky Derby: This photograph from the 1901 Kentucky Derby shows Governor J. C. W. Beckham and a party of dignitaries. Courtesy of the Library of Congress. 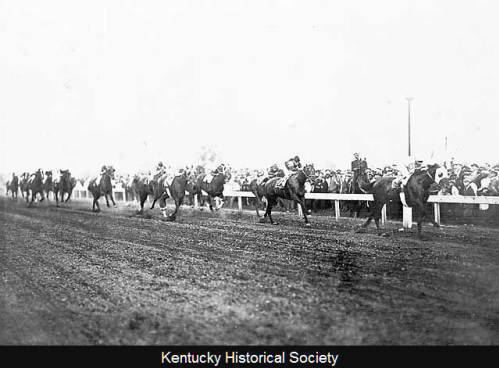 1923 Kentucky Derby: This photograph shows the finish of the 1923 Kentucky Derby. Courtesy of the Kentucky Historical Society. 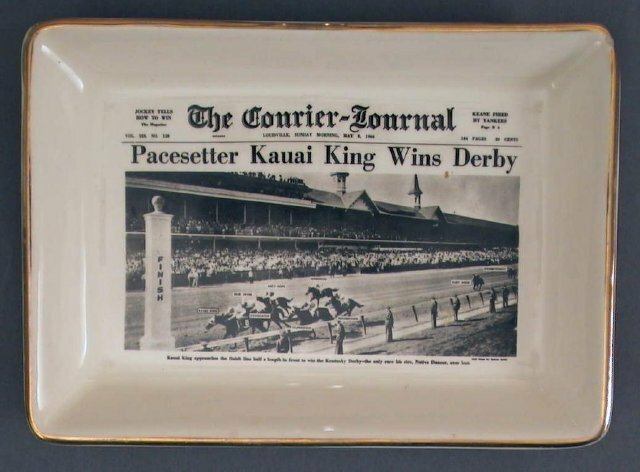 Kentucky Derby Ashtray: Over the years images of Churchill Downs and the Kentucky Derby have appeared on a variety of items, including this ashtray owned by renowned political cartoonist Hugh Haynie. Courtesy of the Kentucky Historical Society. Derby Mini-dress: The Kentucky Derby has become known as a fashion setting venue. 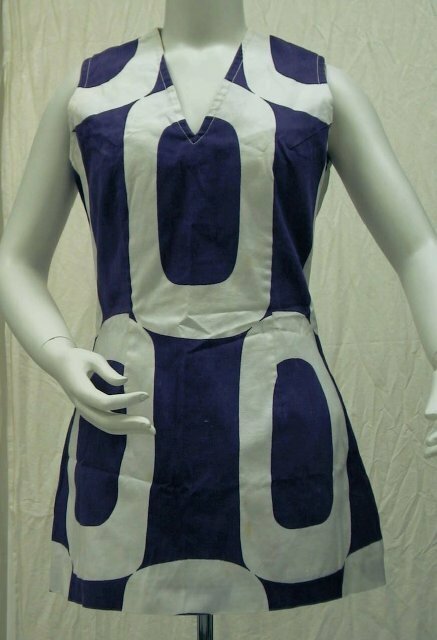 This mini-dress was worn by Katherine Stephanski at the 1969 Kentucky Derby. Kentucky Derby Press Badge: Over the years the Kentukcy Derby has become an international event. 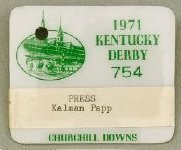 This press identification badge was worn by photographer Kalman Papp at the 1971 Kentucky Derby. Courtesy of the Kentucky Historical Society. 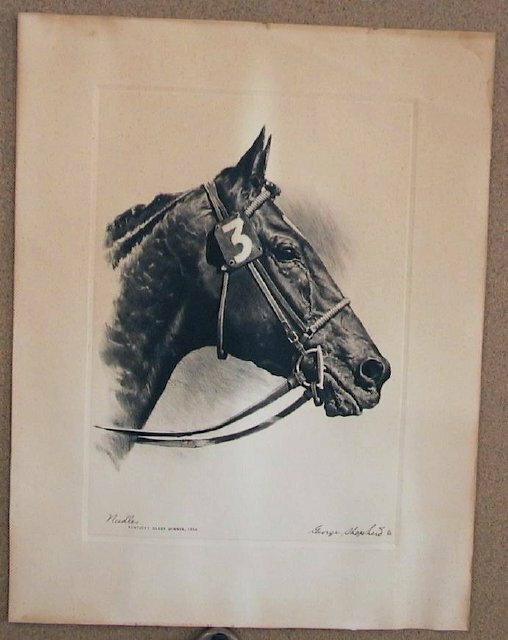 Needles: Often, horses that win the Kentucky Derby become famous and are immortalized in photographs and drawings. Shown here is Needles, who won the Kentucky Derby in 1956. Courtesy of the Kentucky Historical Society. 1941 Kentucky Derby: This panoramic view of the Churchill Downs grandstand and infield was taken at the 1941 Kentucky Derby. Courtesy of the Library of Congress. 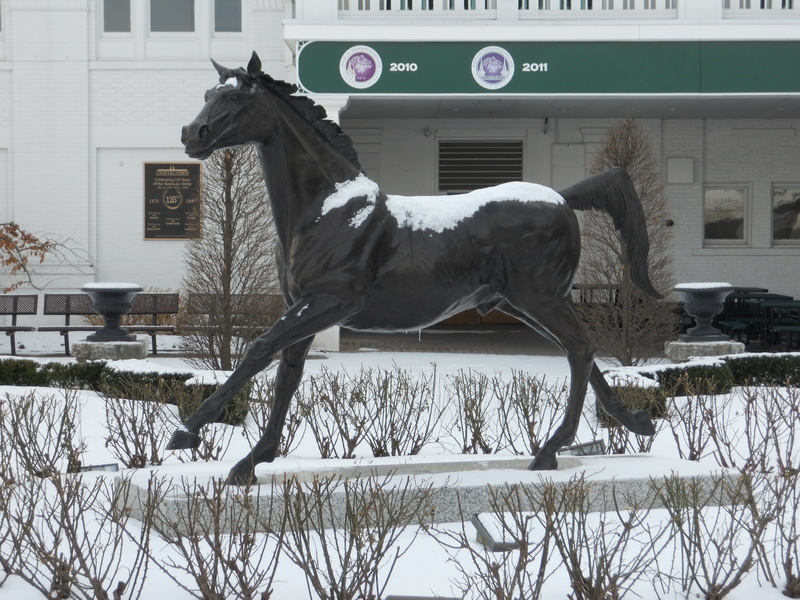 Aristides: This statue to Aristides, the winner of the first Kentucky Derby in 1875, stands at Churchill Downs. Photograph courtesy of Tim Talbott. 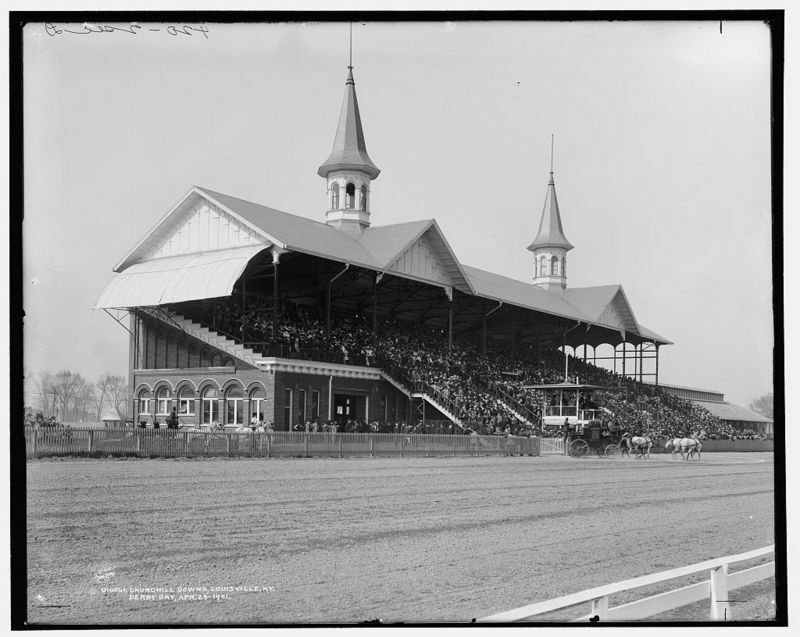 Tim Talbott, “Churchill Downs,” ExploreKYHistory, accessed April 22, 2019, https://explorekyhistory.ky.gov/items/show/318.